I had extensive treatment last year over a period of 5 months. I can't speak highly enough of the wonderful service I received from the whole team. Mandy Knowles, Personnel Manager, Brighton. Tooth sensitivity (also known as dentine hypersensitivity) commonly appears as a pain due to temperature changes, pressure, sweet and acidic food or drink. This reaction may be mild or intense. The classic example is eating ice cream, but simply being out in the cold weather is sometimes enough to set off the problem. Sensitivity to touch can also lead to pain due to tooth-brushing. Research shows that one in three people in the UK suffer from sensitive teeth at any one time. Dentine hypersensitivity can occur from 15 to 70 years of age or more, however the age group when it occurs most is between 20 and 40 years. Any teeth can be affected but the most likely are those at the front corners of the mouth. It is suggested that this might be because these are the teeth which tend to be brushed more vigorously. This leads to the removal of enamel and the exposure of the sensitive under-layer called dentine. Attrition – the wearing away of enamel by tooth grinding. Diet also plays a role in tooth sensitivity. If there is a high amount of acid in the diet this will lead to acid erosion, causing enamel to be removed from the tooth surface. This will then lead to sensitivity. There are a number of treatments than can be carried out to help with tooth sensitivity and some of these are listed below. The use of special desensitising toothpastes can also help greatly with this problem. 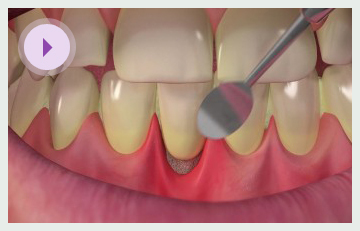 Placing fillings to cover exposed dentine or cementum on root surfaces.